Either Puccini's The Girl of the Golden West is a forgotten masterpiece or it's Puccini's biggest failure. The program from the San Francisco Opera is full of praise, citing various chords and cinematic features, calling it the precursor of movie soundtracks. But is successful opera found in the orchestra part? I think only Wagner managed that. For the first 15 minutes or so Nicola Luisotti's orchestra completely covered the singers on the stage, a situation which gradually improved as the opera went on. Only one small bit in the third act where the tenor is about to be hung sounds like an aria we have heard before. Puccini is supposed to have been trying for another success like Boheme. In Boheme a very long part of Act I excerpts as two glorious arias followed by a famous duet. There is plenty of opportunity for vocal fireworks when Johnson walks into the bar and Minnie and he recognize one another. The problem is that Puccini does not deliver. How is one to evaluate an opera where high C's appear suddenly without warning? If this wasn't Puccini, we would say the vocal writing borders on the downright bad for extended stretches. I liked the production. Two large stone walls, painted brown on one side and gray on the other, form the structure for all 3 acts. Everyone enters the Act I bar down a tall staircase, providing a backdrop for some spectacular entrances. Minnie comes in firing her gun. Then through a lighting trick Johnson appears like magic on the upper landing. The third act is the only one that seems to work. The miners find Johnson and decide to hang him. Just as Johnson finishes asking them not to tell Minnie how he died, she rides in on a very pretty palomino horse and saves him. She tells them, "God gave this man to me." The horse is hitched to a wagon and they ride off singing "Addio." 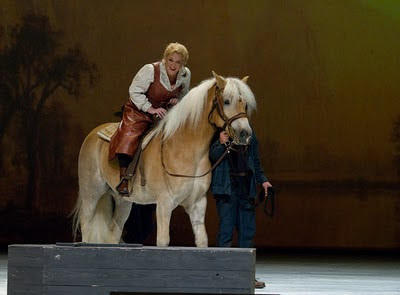 I predicted correctly that Deborah Voigt would reappear on the horse during the bows. Of course we could always blame the singers. I felt a vocal fit with the role only with Salvatore Licitra as Johnson. It's a terrific part for him. The role of Sheriff Rance didn't lie well for Roberto Frontali. Minnie is a difficult role, one that requires a big voice and a big personality to fill it. Deborah Voigt rose to the part, acted Minnie as the complex individual she is and handled the difficult singing. She projected perhaps a little more self-confidence than Minnie seems to feel about herself. But Voigt is right. Her voice is better suited to German repertoire. I've seen this opera a number of times and have begun to wonder if anything could save it. Maybe it would work as a comedy.